“It sounds a little cliche but, leave something better than when you found it”. The place kicker out of Louisiana State University has certainly done that at every turn. He leaves College Football with the NCAA record for career field goals made at 97. 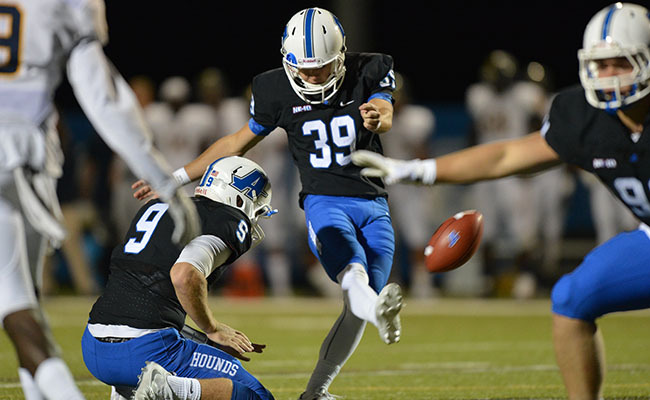 He holds many of the kicking records at both of the colleges he has spent his career at. More than that, he has improved and enhanced the programs that he leaves behind. Tracy’s sporting career began whilst growing up in Camarillo, California. He was a soccer star at a young age, and his sister, Lauren, plays soccer at Monmouth University. Despite being a talented player, Cole reached a crossroad where he needed to decide if soccer would be his future. “Even though I was playing soccer, I feel like football was still always in the back of my mind number one. I kinda got to an age in my soccer career where I had to figure out if this was what I wanted to do. I ultimately decided playing football, and specifically kicking, because a family friend of ours was a college kicker and kind of convinced me to go out on the practice field one day”. It was love at first kick and started him on his path to the NFL Draft. “I remember the exact day. I fell in love with it, and kinda had an idea of that’s where I wanted to go”. Growing up as a Seattle Seahawks fan, Cole found kicking inspiration in Steven Hauschka. He couldn’t have known it at the time, but the two kickers have taken a similar journey to the NFL. “He was in Seattle, and I grew up a Seahawks fan. So, I was very familiar with him and he kind of did the same graduate transfer thing that I did. He came from a Division III school and ended up going to North Carolina State during his grad year. I also just liked his kicking style. I feel like him and I kinda have a lot of things similar”. Unlike Hauschka, it would be a Division II school where Cole Tracy would spend his college career. It is around 3000 miles from Camarillo to Assumption College, Mass. and he told me about the process that took him across the country. “To be honest, I didn’t get a whole lot of looks out of high school in terms of the big Division I schools and I was ok with that. I knew that I wanted to play college football and I wanted to go where I was wanted. Basically I sent emails out to just about every school in the country and Assumption College was one of the few that showed some interest. So I jumped on it and took a visit out there, and absolutely loved it. I was up for the challenge”. “I was there for four years, played for three, developed some of the best relationships that probably I’ll ever have in my life. It’s a very small knit, two thousand person community. I can’t thank them enough. They really gave me a jump start to my career and I just enjoyed every minute of it”. “When I came in to Assumption, they didn’t see a lot of winning seasons and I was very fortunate to come in with a few classes that really jump started that program with Coach Bob Chesney, the head coach. So I think I hit it at the right time, but as a group of two or three classes we really did make that football program a lot better than when we found it”. Despite making Assumption College a better team than when he found it, it wouldn’t be the platform that he would need to get from College Football to the NFL. He needed a higher platform, and that came in the form of LSU. “Basically, the 2017 season ended and I knew this was something that I wanted to explore. So, we started making phone calls once the season was ended and there was a football coach who knew the LSU special teams co-ordinator and that coach was like sorry I can’t take you at my school but I know someone who is looking specifically for a grad transfer, let me go ahead and pass on your number. So, 30 minutes later I was on the phone to LSU and I was sold from there”. To go from kicking in a five thousand capacity stadium in Assumption to a one hundred thousand capacity atmosphere in Tiger Stadium must have been quite a change? “You can’t really compare it. I have a panoramic picture of Tiger Stadium right now above my TV, and I’m sitting in my room and looking at that picture and trying to imagine the Assumption Stadium. They’re both great environments for what they are, Assumption might not hold a lot of people but some of those playoff games got pretty rowdy and I loved those experiences. But then playing in Death Valley, and Tiger Stadium, there’s nothing else like it. It’s an experience that can change your perspective on College Football”. LSU had seen it’s share of kicking troubles before Cole Tracy arrived. On his mantra of “leaving something better than when you found it”, he certainly did. He leaves with the LSU records for longest field goal, field goals in a game, field goals in a season, and field goals in a bowl game. Cole was a finalist for the Lou Groza award which acknowledges excellence in kicking. He was made a permanent team captain in 2018. His field goal made percentage of 87.9% was second in College Football. It’s been quite the year for him. “It started off with a bang, there have been a few specific memorable games but, the whole experience, between the Tiger Walk where we walk down a hill with the LSU fans before a game, running out of the tunnel for these massive games. The first game, playing in Cowboys stadium against Miami. The game winning kick against Auburn, and playing teams like Alabama. There’s a selection of specific games but overall the entire journey and the entire year [have been the highlights]“. Cole mentioned the game winning kick against Auburn, and that itself has a place in his story. It was the first game winning, walk off field goal in LSU history. He was carried off the field on the shoulders of his fellow players. Shortly afterwards, his work on the field began to pay dividends off the field for his former college. Tracy is actively involved in raising the profile of Assumption College even after leaving, but this fundraising wasn’t his doing. The College began to receive donations from miles away in Louisiana. “That just shows how great Tiger fans are. People say they’re the best in the country and after this season, I was able to believe it and see it first hand. We didn’t ask for any donations, but it started to become a fad that took over the whole season as a thank you to Assumption College, which is great…I’ve been gone for a few months and to be able to bring some income to that school and in to that program, I know it’ll go a long way for them. I’m very thankful for Tiger fans and I’m glad that they were able to help out my school”. The move to a higher platform at LSU paid off at the end of the 2018 season. After his impressive performance this last year, Cole received an invitation to the Senior Bowl and NFL Combine. It was a mixed performance on the field during practice for the Senior Bowl, and the game itself started badly with a missed PAT. He redeemed himself by hitting field goals of 33 and 43 yards. “There were some things that I did well and there were some things that I would have wanted back. Kicking, specifically, sometimes you’re judged based on one kick but there’s a lot more to it. Morten Anderson, I’ve been mentored by him, and there’s one thing that he constantly told me and preached to me is, it’s a marathon and not a sprint, so there’s going to be times that you do things well and times that you don’t, so it’s kind of how you continue to progress”. The road to the NFL can feel like a marathon and once you’re there it is more like a sprint. In 2018 a number of kickers were cut during the season in what seemed like a bad year for the position. What does Cole think are the keys to being a successful kicker? “I think you have to forget about the good and the bad. You can’t really get caught up in a good performance and you can’t get caught up in a bad performance. You have to find that balance between when you do something well obviously reflect on it and build upon it, but also kind of forget about it. Also, the same when you do bad. Don’t take it as the end of the world or as the sky is falling. Get a positive out of it and move on. That’s something that I try and focus on, getting a positive out of every situation”. From LSU Tiger to Chicago Bear? The Chicago Bears are one team that had well documented kicking problems in 2018. It was reported that they had met with Cole during Senior Bowl week and a number of Chicago based news outlets have him pegged as the solution to their kicking issues. Does he have a feeling of which teams are interested in him? “It’s pretty tough to narrow it down. You don’t really know who’s looking and who’s not looking. I mean, I’ve heard plenty of stories where it’s the team you didn’t even talk to, or didn’t talk to a whole lot, that’s the team that ends up picking you up…I’m just looking to make a team and looking to compete in any way I can. I’m hoping to make it in to a camp and show what I’ve got”. When he makes it on to a team, and in to the league, Assumption College may find themselves with even more donations. 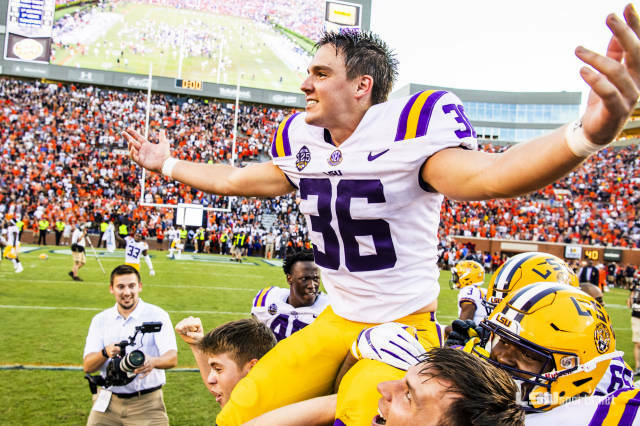 After a bad year for kicking, you can rest assured that Cole Tracy will spend his career trying to make the NFL better than when he found it. Many thanks to Cole Tracy for giving up his time to speak to me. Also, to Lori Evon at JL Sports for her time in organising this interview. Ninety-Nine Yards: American Football for UK fans launched in 2018 and covers all aspects of the game from National Football League (NFL), Canadian Football League (CFL), and College Football (CFB), down to the grass roots of the game here in the UK with British American Football (BAFA). Ninety-Nine Yards is also a weekly podcast hosted by NFLGirlUK and fellow members of the team. It features interviews with both current and former NFL stars and you can listen via Spreaker and Apple Podcasts. Listen to "Ninety-Nine Yards" on Spreaker.